This USB-C multiport adapter turns your Windows® laptop into a portable workstation. The USB-C to dual DisplayPort adapter connects your USB-C laptop to two DisplayPort monitors, letting you power through work faster or make presentations with different views on two displays. It gives you two USB-A ports, a Gigabit Ethernet port, a DP Alt Mode Switch, and laptop charging. 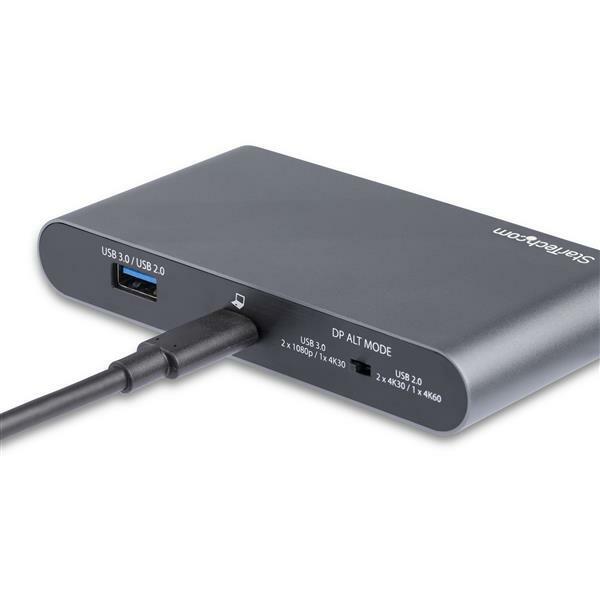 Through 100W Power Delivery 3.0, the USB Type-C to DisplayPort adapter powers itself as well as your laptop and any attached peripherals, with up to 85W laptop charging when connected to a USB-C power adapter. PD 3.0 features Fast Role Swap to prevent USB data disruption when you unplug the power adapter to switch power sources (USB-C power adapter to bus power). The USB-C video adapter extends your laptop screen to dual DisplayPort displays. Using the DP Alt Mode switch, you can choose between higher display resolution or faster USB speed to meet your needs, for desktop or portable use. Choose between: dual 4K30 (or single 4K60) resolution with USB 2.0 speed, or dual 1080p (or single 4K30) resolution with USB 3.0 speed. The maximum Ethernet speed is 1000 Mbps in USB 3.0 mode, and 100 Mbps in USB 2.0 mode. The USB-C hub with DisplayPort gives you two USB-A ports (one USB 3.0/USB 2.0, and one USB 2.0). The GbE port ensures reliable network access. 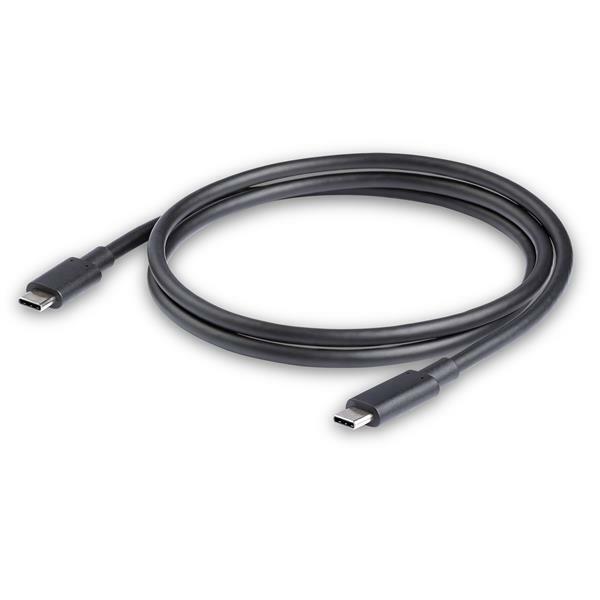 A 1 m USB-C cable is included for set-up flexibility. DK30C2DAGPD is backed by a StarTech.com 3-year warranty and free lifetime technical support. Note For a dual-monitor configuration the host laptop must support MST. Not all USB-C ports support the full functionality of the USB Type-C standard. 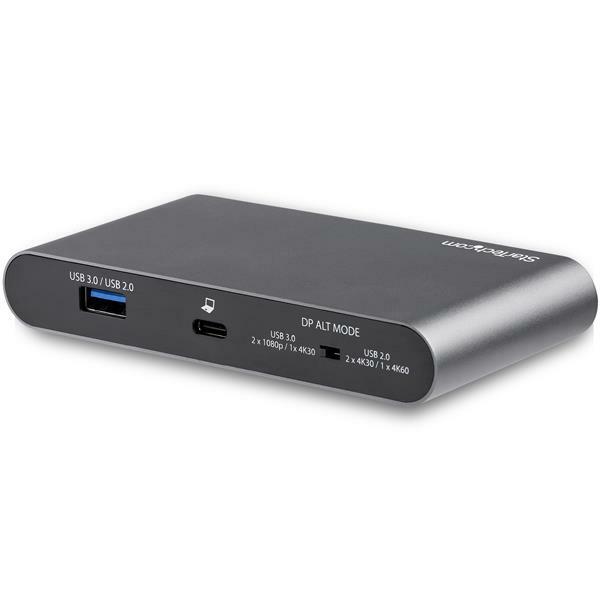 Ensure that your host USB-C port supports USB Power Delivery 2.0 or 3.0 and DP alt mode. The adapter can connect to a host laptop’s USB-C port that doesn’t support USB Power Delivery 2.0 or 3.0. However, in this configuration if a power adapter is connected to the multifunction adapter, it will not pass power through to your host laptop. The multiport adapter provides limited Chrome support (no MST support; Ethernet only when using bus power). The multiport adapter provides limited Android support (no MST support). Video output capabilities are dependent on the video card and hardware specification of your connected laptop. Your laptop may have specific requirements for charging. This USB-C multiport adapter supports USB Power Delivery 3.0, up to 100W. When using your laptop’s USB-C power adapter, the multiport adapter powers both the adapter (with attached peripherals) and your laptop - with up to 85W charging available for laptop charging. For more information on your laptop’s charging requirements, refer to the manufacturer of your laptop. Through support of USB Power Delivery 3.0, the multiport adapter supports Fast Role Swap which prevents USB data disruption when you unplug to switch power sources (USB-C power adapter to bus power). In USB 3.0 mode, the maximum Ethernet speed is 1000 Mbps. In USB 2.0 mode, the maximum Ethernet speed is 100 Mbps.